What is a karate style? How does one style differ from another? How have particular styles developed over time? What makes a style traditional? Why have different versions of the same traditional kata developed? What is the best style of karate? What is the difference between orthodox and traditional styles of karate? There are many, widely-varying answers an experienced Karate practitioner can supply to the above questions. We can talk on history, philosophy, culture, technique, purpose, physical structure, geography, politics, etc. We can address the evolution of Karate form its early Chinese roots, to its birth in Okinawa and its introduction to Japan and the rest of the world. We can discuss the differences between Karate-Jitsu and Karate-Do, and their impact on style development. The advantages and disadvantages of the various styles can be discussed. The list can go on and on!! One of the first points to be addressed in this article is what is meant by the word "traditional". The Webster Dictionary defines traditional as ..."the transmission of information, beliefs, customs, etc., from ancestors to posterity ... also a belief, practice, etc., so transmitted, ... something handed down from the past; an inherited culture, attitude, etc." In the Karate-do arts today, when we talk of traditional styles, we refer to the modern day styles of karate which began to appear around eighty years ago, and are very important from an historical viewpoint. The earlier styles from which the "traditional" styles evolved are generally referred to as the "Orthodox" styles. The orthodox styles include: Shuri-te, Naha-te and Tomari-te. The Orthodox styles had their birth in the earlier art of "Te" which was what the Art of Karate was called in its earliest stages. Another word which cane into use a little time later was "Tode". Both of these names were used to describe the method of self-defense used by the Okinawans. Over the years, the development of Te focused upon three geographical areas of the island. These were the villages of Shuri, Naha and Tomari. Although all three of these areas are located in the southern portion of the Island, each had some unique qualities which resulted in the development of different styles of self-defense. The Village of Shuri was the home of the King and the Noble families. Naha Village served as the major commercial center, while Tomari Village was primarily a farming and fishing community. Most of the traditional styles of karate known throughout the world today trace their lineage to one or more of these earlier orthodox systems of Okinawan Karate. The one major exception to this point is the lineage of the Uechi-ryu Style which developed basically independently from its earlier roots in China. Prior to taking a detailed look at the katas comprising the various traditional styles of Karate-do practiced today, the following points must be raised to eliminate any confusion when comparing katas found within the various Japanese and Okinawan styles. First, almost all Japanese styles of modern day Karate-do evolved from the late Master Gichin Funakoshi's "Shotokan" style introduced to Japan in the early 1920's. Secondly, the katas of the Shotokan system were altered versions of the original Okinawan katas. 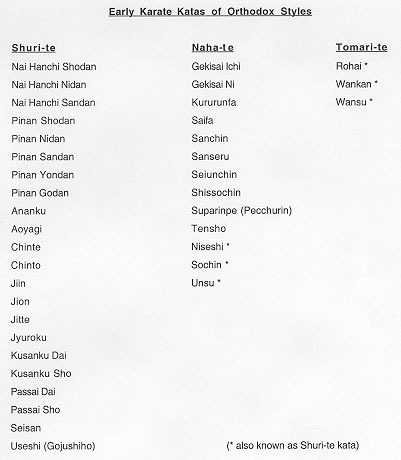 The alterations included: pattern changes, technique/stance modifications, spelling/pronunciation changes to the kata names, and changes in the order of some of the katas. The spelling/pronunciation changes were in many cases a function of the language differences between China, Okinawa and Japan. As an example, the Kanji for the Okinawan kata "Pinan" would be read as "Chinan" in Chinese, and "Heian" by the Japanese. 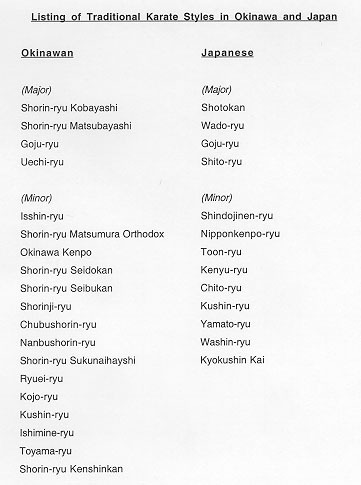 Other name changes resulted from different translations of the kata name or a complete change in the name to make it more acceptable to the Japanese. 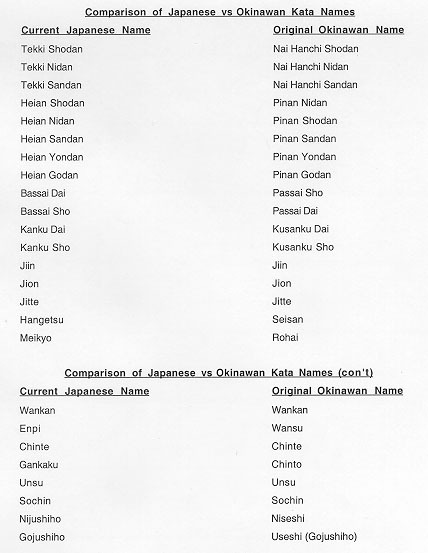 A comparison between the names of the katas of the current Japanese styles and their earlier Okinawan counterparts is presented below. Trying to place exact dates on when the various traditional styles of karate started is hard to do as many times the style names may have not been made public. However, from a general historical viewpoint, most of todays popular traditional styles were founded/named during the period 1930's to 1960's. Prior to this period, the karate-kas generally referred to their art as "Okinawa-te" or more specifically as "Shuri-te", "Naha-te" or "Tomari-te". The naming of todays styles was an end result of many factors, the most significant being the increased popularization of the art which resulted in increased pressure for standardization and thus "name giving" to distinguish one Master's teachings from another. The key factors resulting in the increased popularity of karate in Okinawa was its introduction into the public school system. Prior to this time most of the early karate instructors limited their teaching to a small handful of students. The individual generally considered responsible for the introduction of karate into the school system was Yatsune Itosu (1830-1915) in the early 1900's. Itosu at this time was already well along in years and as a result he was assisted in the teaching by his two senior students: Kentsu Yabu (1863-1937) and Chomo Hanashiro (1869-1945). With the expansion of karate in the school system, the art became exposed to a larger portion of the general population. With more and more people practicing the art, the various public schools started to take on a major role in the evolution of Karate. Over time each of the schools tended to become associated with a particular teacher and or "style". The introduction of the Okinawan Art of Karate to Japan in the period 1915 to the early 1920's, by Gichin Funakoshi (1869-1957) and Okinawan Kobudo by Shinko Matayoshi (1888-1947) resulted in a situation which tended to parallel karate's growth in Okinawa. In Japan like Okinawa, Karate was popularized primarily through its introduction into the educational system of the country. However, in Japan the difference was its introduction into the College system. Jigoro Kano (founder of Judo) was helpful to Funakoshi in paving karate's way into the University system. Building on the Japanese peoples interest in a wide variety of Martial Arts, Funakoshi and his subsequent senior students established Karate Clubs at most of the major universities in Japan. This introduction of Karate at the College level would later give birth to the development of sparring competition between schools which preceded the introduction of karate tournaments in the early 1960's. It should be noted that the establishment of a new style in the past was quite unlike what we see all too often today, where it seems new style after new style is founded by individuals who after earning their Shodan or Nidan in "record time", go on to start their own "improved style". In the past the typical Okinawan or Japanese individual studied under a Master(s) for an extended period of time and received their Teachers License (Renshi) or Senior Teachers License (Kyoshi) prior to founding their own style, if ever at all. their style was generally a "Kan" or version of their teacher's style - "Ryu". A good example of this "Ryu / Kan" structure utilized in the traditional Okinawan and Japanese arts is found by examining the Shorin-ryu system with its numerous Kans (styles). Although the katas included in each of the Shorin-ryu styles vary, the modern day Shorin-ryu styles trace their lineage to the earlier Shuri-te and Tomari-te orthodox styles primarily. As noted earlier, it is impossible to look at the evolution of the traditional styles of Karate without considering their katas. One obvious question that arises is - Why do differences exist in similar katas taught in the various traditional karate styles? Additionally even greater confusion arises when one realizes that many of the styles trace their lineage to the same teacher or teachers!! How then did the differences in kata occur when each teacher / style claims to be traditional? There are a number of answers or reasons for this situation. First, it must be recognized that in the early days of karate, the katas were not taught in a systematic way as they are today. Secondly, as a result of smaller numbers of students per instructor in the earlier days, it was common for the teachers to give more individual attention to each student. As a result, the teacher many times adjusted techniques to suit a particular students ability or physical stature. thirdly, students tended to stay with their teachers for a much longer period of time which further facilitated the individualization of technique. Lastly, the application of the martial art principle of "Shu-ha-ri" had an effect on the kata and technique. This principle not only applies to the techniques of karate but also the development of ones character. It is therefore easy to see how the traditional teaching practices of turning a student into a teacher occurring prior and during a period of unprecedented growth in the popularity of the art, gave rise to the differences we observe today in the various traditional styles. However, even with the differences, traditional kata can be identified by the fact that they have a lineage to the early orthodox katas, each technique had a meaning, and the practitioner should be able to perform the techniques in an instinctive manner. The Art of Karate has enjoyed a rather dynamic history both in Okinawa and Japan. The Art has has undergone constant evolution while maintaining its traditional values. The number of traditional styles in evidence today carry on their heritage through their katas. Their katas are the connection to the past - their lineage from the earlier orthodox styles. This is one of the key differences between traditional styles of karate-do and the myriad of "eclectic styles" popular today. Traditional Karate is an art with its foundation based on practical self-defense techniques. It is through the multiple levels of "Kata Bunkai" (interpretation of the movements in the katas form the base level to the advanced) and "Kakushide" (hidden techniques of the katas involving joint locking and nerve point techniques, etc.) that the self-defense teachings of the early Masters comes alive. Just as there is more to a "style" than "just a name", there is more to traditional karate than just doing the correct set of katas (although for too many individuals today call themselves by a specific traditional style name but do not do the katas of the system they claim membership and rank in). Traditional dojos can offer the serious student a connection to the knowledge of the early Masters in a way not available from the modern eclectic schools. The connection comes from the stability of teaching, availability of knowledge from style certified teachers, senior teachers and Style Masters who as in the case of the late Okinawa Kenpo Karate-Kobudo Master Seikichi Odo brought over 60 years of experience to his students. Another area which always seems to be a topic of discussion whenever more that two karate-kas get together is - Which style is the best? The best answer I ever heard to this was given by the late Master Robert A. Trias, the Father of American Karate and the founder / Director of the United States Karate Association. Master Trias stated at one of his seminars that "... there is no such thing as the best style of karate - there is only good karate and bad karate". In other words we can not hide behind a "style" as our excuse for doing poor karate from a technical viewpoint, as we all have a similar body structure and there are only certain ways to get the maximum out of our bodies. Each style may have certain techniques or teaching concepts it emphasizes, but the underlying principles of body movement are basically the same. An example of this point would be a simple front stance utilized in the Okinawan and Japanese styles. The Okinawan styles for the most part utilize a "Seisan Dachi" as their basic front stance, while the Japanese styles tend to use the longer "Zen Kutsu Dachi". Although the length of these two basic stances differs, both rely on the same technical concepts to achieve correct application. In point, the width of both stances is approximately shoulder width of the individual, both stances require the front foot to be slightly turned inward for correct bone alignment, both stances address the correct positioning of the hips before and after execution of a technique, the list could go on and on. In other words - good karate technique. Traditional Karate teaches the practitioner to always be a student of the art, to adapt and to expand your knowledge , all while keeping the traditional values in tact. It is unfortunately something that is all to often left out of the programs of todays fast buck / quick rank programs. The bottom line is that traditional karate will not die out as it still provides a valuable product in our modern society. Fifty of one hundred years from now, the names may have changed, but the values of the art will remain. These values include: honor; integrity; perfection of body, mind and spirit - in short, truly a worthwhile way of life.